Moondancer - Equestria Ever After The test at Celestia's School for Gifted Unicorns was something of a red herring. According to legend, the pony who successfully opened a dragon egg would be destined to become a princess, and so Celestia passed the egg by as many unicorns as possible. Obviously, failing to hatch the egg could not disqualify one from entering the school, or everypony in it would have a baby dragon of their own. No, it was a test of power and character. Twilight Sparkle's brute-force attempt to open the egg, without the magical surge caused by Rainbow Dash produced a less than spectacular result, preventing the young filly from opening the egg, earning her cutie mark, or entering the school at all. While Moondancer was not successful in opening the egg either, her various attempts to do so demonstrated her resolve, knowledge, and magical potential. With Sunset Shimmer having already failed Celestia, and no Twilight Sparkle to mentor, Moondancer became the next best alternative to Twilight Sparkle as the prime timeline would know her. Thus, it was Moondancer who wound up as Celestia's personal student after distinguishing herself in her first years at school. Consequently, it was Moondancer who was sent to Ponyville to prepare for the Summer Sun Celebration with the order to "make some friends". Like Twilight, Moondancer too was worried about the coming of Nightmare Moon, and more focused on her return than on making friends. Stubborn and focused, Moondancer did become acquainted with many of the same ponies, but failed to build the kind of connections necessary to insure the bonds of friendship formed deeply and quickly. After the return of Nightmare Moon, Moondancer went to the Castle of the Two sisters, alone, to face down Nightmare Moon, and found herself unable to summon the Elements of Harmony, or mount any effective resistance to Nightmare Moon. Nightmare Moon, however, had plans for Moondancer. Being Celestia's apprentice, Moondancer became the vehicle for Nightmare Moon's revenge against her sister. Moondancer was captured by Nightmare Moon, and subjected to all manner of humiliations and tortures, some of them quite fiendishly clever. Nightmare Moon's first actions with Moondancer were not punishment, but reward. In a very public ceremony, Moondancer (under magical duress) was forced to accept an award from the new Queen for her loyalty and devotion. Moondancer's attempts to stop Nightmare Moon were re-framed as the acts of a loyalist. The story was easily accepted given her name, her cutie mark, and the public's need to blame somepony for their lot in life. Moondancer was always easy to dislike, and even easier to hate. This was further compounded by titles and rank, public accolade, all designed to alienate Moondancer from anypony who might have otherwise rallied behind her attempts to liberate Celestia. In very short order, Nightmare Moon released Moondancer knowing the only safe haven for the pony would be among Nightmare Moon's own loyalists. Contempt for the young mare came from every quarter, and friends and family alike turned on her. Rejected and alone, Moondancer found the only sanctuary she had was in the court of her greatest enemy. Nightmare Moon offered Moondancer the role of apprentice, which she was eventually forced to accept, though she still plotted against the new Queen. Well aware of this, Nightmare Moon's tutelage was harsh and unforgiving. Failure was met with cruel punishments, and success always came with rewards that further alienated her from normal ponies. In time, Moondancer simply stopped resisting the role that was crafted for her. If the public hated her, she would give them reason to hate her. If everyone thought she was evil, she would be. If she was supposed to be cruel, she'd been taught many potent lessons on how to be cruel. In time, Moondancer became exactly what eveypony always assumed she was. 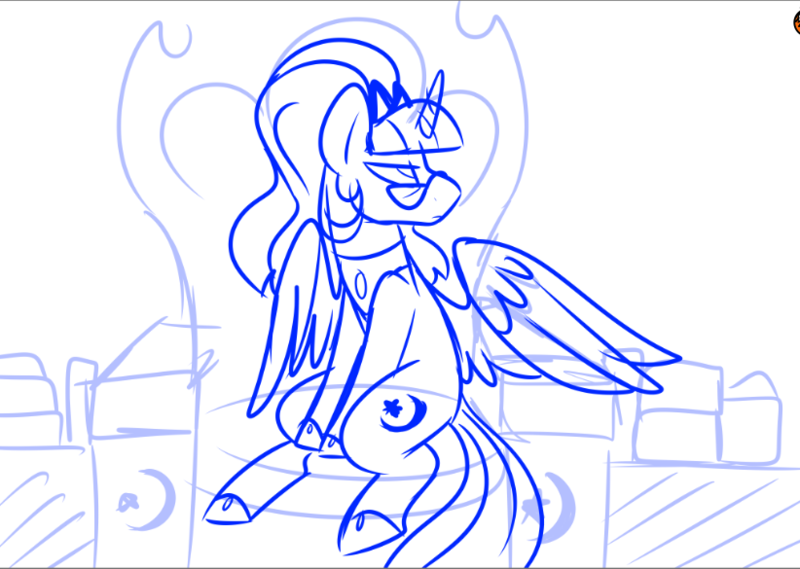 Her loyalty and status eventually resulted in her ascension to becoming an alicorn, though in a limited fashion. Never one to grant someone powers that could rival her own, Nightmare Moon arranged for a kind of limited alicorn-hood for Moondancer. She was granted wings, and greater power, though her level of power was capped to prevent her from becoming a real threat to Nightmare Moon. Nightmare Moon, however, did promise that Moondancer would be her true heir on the day she figured out how to break past that limitation. Cutie Mark: A crescent moon and three stars. She's come to assume that serving Nightmare Moon was always her destiny. Oh yeah, this fits soooooo well. Bean is doing some awesome work of Noctus-Moondancer!